Whatever you call them, they’re absolutely one of those convenience foods that are infinitely better when homemade. 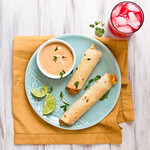 We usually make flautas (taquitos) with leftover pulled pork, some chopped onion, and a little cheese – nothing else – and then dunk them into some Chuy’s-inspired Creamy Jalapeno Ranch or barbecue sauce (we have clearly-drawn battle lines in this house). This time, we put the ranch in the flautas. You’ve probably seen the base for this recipe somewhere. It’s quite popular, having been made by some of my favorite bloggers. Our version uses a homemade Chipotle Ranch Dressing instead of salsa. The chipotle ranch is killer as a dipper for sweet potato fries and it’s even better here. I doubled the recipe (big batch shown below) to make sure that we have plenty of good football eats on hand for the weekends, and ended up with nearly quadruple the taquitos (flautas) because I used the smallest tortillas I could find (~5 inches). And instead of individually wrapping each flauta (taquito) destined for the freezer (no way), I just bagged them up in 2 large freezer bags after freezing solid on baking sheets. Nothing stuck together and I didn’t waste a ton of plastic wrap. I also did an even split between corn and flour. Corn tortillas get crispier in the oven but I prefer the taste and texture of flour tortillas much more (another southeast Texas thing). And they’re a lot easier to work with, though I have to confess – I only had 1 corn tortilla tear on me this time. My failure rate is usually much, much higher. Like near slamming cabinet doors and expletive levels. 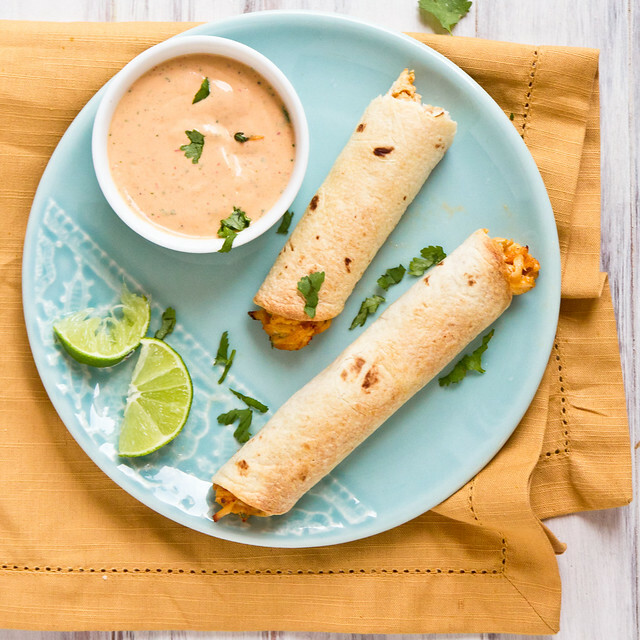 Creamy baked chicken taquitos dressed up with a homemade chipotle ranch dressing. It's the perfect snack for gameday. If you despise shredding chicken like I do, check out this tip to do it in seconds! Preheat oven to 425 and line 2 baking sheets with parchment or Silpat (if not preparing for the freezer). Mix together the cream cheese, ranch dressing, chili powder, cumin, onion, garlic, and cilantro until uniform (a mixer makes this easier but can be done by hand). Fold in the chicken and shredded cheese until well coated. Spoon ~3 Tbsp of filling into a line across the lower 1/3 each tortilla. If using corn tortillas, work with 3 at a time, microwaving for 15-20 seconds on a plastic wrapped plate before filling and rolling. Roll each tortilla up tightly and place seam-side down on the pan. To freeze, stop here. Place the pan(s) into the freezer and freeze solid, ~2 hours, and then transfer to a large ziptop bag. Bake 15-20 minutes (~25 if frozen), until crispy (and lightly browned, if using flour tortillas). Serve with additional chipotle ranch, guacamole, and sour cream if desired. I love taquitos! I always thought flautas were with corn tortillas and taquitos with flour. But I probably made that up. These look delicious! We call them taquitos around here; I’ve never heard of flautas. Come on, we both know that REAL taquitos are breakfast tacos from Whataburger! 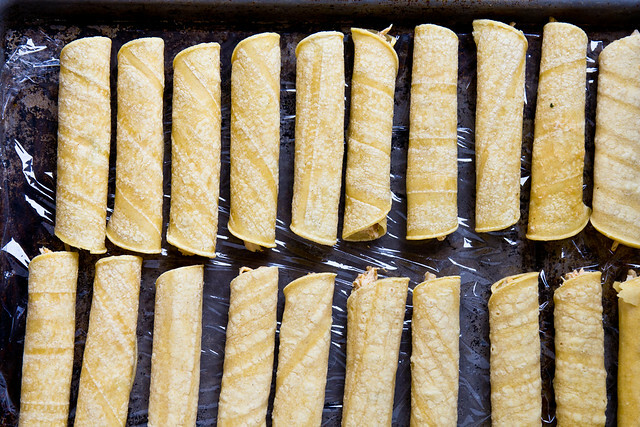 Who can pass up a potato and egg taquito? 🙂 By the way, I live in Houston too. These flautas look great! I’m going to add these to my list for next week. I’m pregnant with triplets and on bed rest so I need freezable meals. Perfect, thanks!! I love the idea for this variation. Though I’m usually pretty high on the corn tortilla failure rate. I may be making these soon. great post! I love the pics! I definitely thought these looked/sounded familiar – I really need to try these now! My taquito experiences have been limited to the frozen kind thus far. Taquitos are skinny (look like they were wrapped around a fat pencil). Flautas are much fatter. I love how Mexican food is so accommodating to different preferences of shell-to-filling ratios. Somewhere in my mind I must have known that flautas and taquitos were the same thing but just never put the pieces together. How funny. Whatever you call them, they sound über tasty! These look delicious! And that dipping sauce? Mercy! They look like a perfect weeknight family dinner for over here. And I’m hungry right now. And its time for dinner! Holy Moly, hook me up with a plate full of those!! These look so good! I love the ranch in the taquitos. Being from southern California, not all that far from Mexico, I have always seen “taquitos” with corn tortillas and “flautas” with flour 🙂 Taquitos are one of my favorites…topped with lettuce, sour cream, gaucamole and of course, don’t forget the hot sauce! Mexican, or Tex Mex always confuses me with the names. But I’m a big fan, and eat them all nonetheless. These look awesome. Sure wish I had some right now! 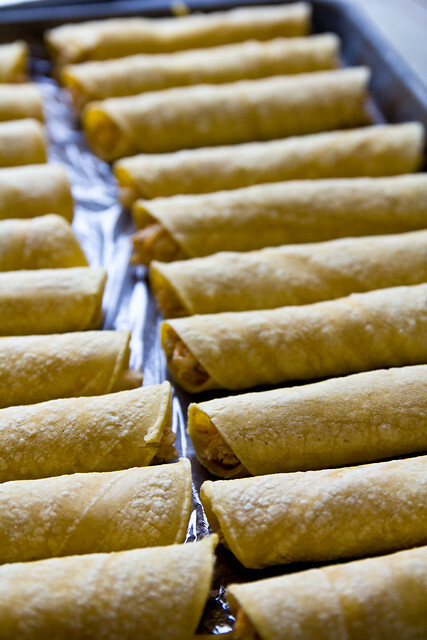 From my understanding (from So Cal) taquitos are made with Corn Tortillas and Flautas are made with Flour Tortillas. I believe that to be the only difference and how to designate what to call it. Additionally, I have never have been able to eat frozen taquitos. Once you make homemade, frozen is disgusting. These are fantastic! I’m so glad I fell upon your website and this recipe. I made taquitos according to your directions with one modification: I brushed garlic oil on top of the tortillas before baking. The chipotle ranch dressing is fabulous and your tips for freezing were very helpful. I will be making these again. Thank you! I’ll be making these this weekend for sure. Love that they are baked, not fried. Oh my! I just made these tonight and I sat back, ate my taquitos, and reveled in the praise and admiration of my cooking prowess. Teehee. Even the kids asked for seconds. love love LOVE the idea of using this chipotle ranch IN the taquitos!! Brilliant girl you are! I made these for cinco de mayo (with margaritas of course) and they were yummy! If you dunk the corn tortillas in simmering low sodium chicken stock for about 10 seconds, they will not crack and break and when you bake them in the oven they taste like they were fried and get super-crispy. I actually had a hard time convincing my husband that I had not fried them!